Nest co-founder and CEO Tony Fadell is leaving the company, a move that may mark a shift in strategy for one of the early stars of the Internet of Things. Fadell founded the startup, which makes connected thermostats and other smart-home gear, in 2011 with co-founder Matt Rogers. Google bought Nest in 2014. In a blog post on Friday, Fadell didn’t say much about why he was leaving but said he would become an advisor to Alphabet, the parent company of Nest and Google, and its CEO, Larry Page. The resignation came after news reports that said Nest was suffering from internal turmoil. In his parting note, Fadell said the company was growing fast and had a bright future. To take Fadell’s place, Alphabet has hired Marwan Fawaz, the former head of Motorola’s set-top box business. That choice suggests Nest may change the way it sells its technology. The company has made its name selling Internet-connected thermostats, smoke detectors and cameras directly to consumers. Fawaz’s background is in devices distributed through cable companies. Sales and installation by service providers is a growing trend in home IoT. 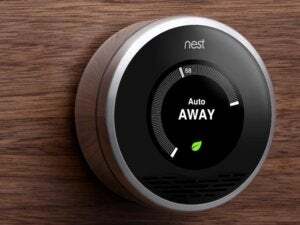 Shifting its focus from retail device sales to IoT as a service might be a smart move for Nest, Jackdaws Research analyst Jan Dawson wrote in a blog post on Friday. “The retail model for the smart home seems pretty stuck right now,” Dawson wrote. Delivering smart homes as a service gets around high upfront costs and headaches that can come with device installation and integration, he wrote. AT&T and security company Alarm.com, among others, have found success with this channel. Fadell said his transition out of the company had been in progress since late last year. He said Nest has had double-digit revenue growth for more than four years. In addition to selling its own devices, Nest lets third parties develop other products and services that work with its platform, and there are more than 18,000 developers involved in that now, Fadell wrote. It also originated the Thread IoT networking protocol, now managed by the Thread Group.